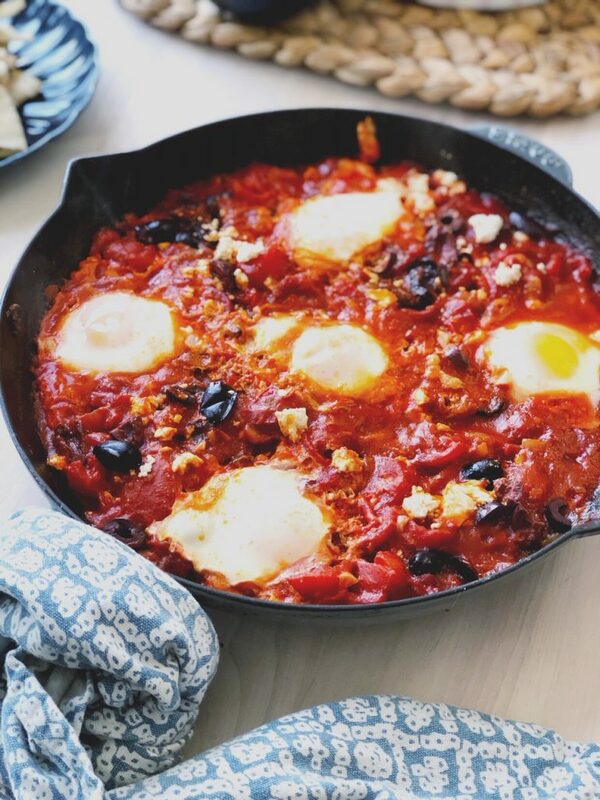 I think it’s important to have a few reliable go-to recipes you can make for any meal of the day, from breakfast to brunch to dinner or a snack. You all already know how much I love a you-do-you-boo recipe, and this is definitely one of those. 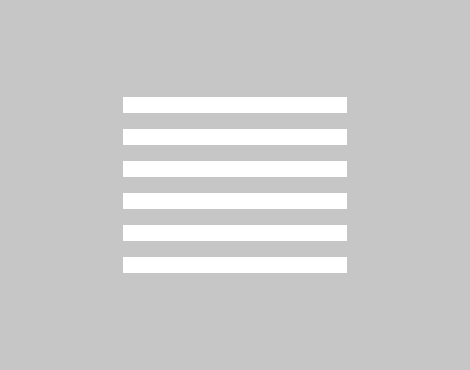 A Shahshuka is easy, simple, quick and totally customizable to your preferences. Don’t like feta or olives? Leave them out. Not feeling cumin? Skip it. Don’t like it spicy? Totally fine! 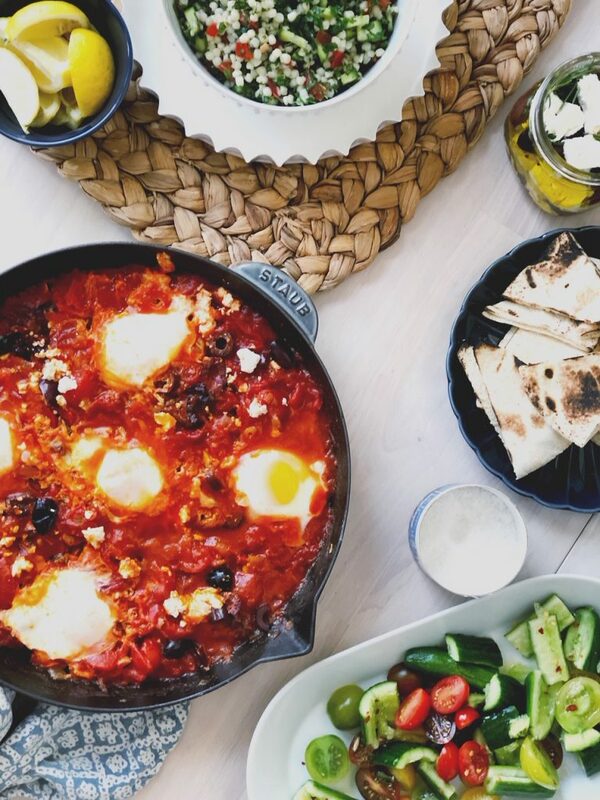 A Shakshuka is traditionally an African dish with eggs baked into a seasoned tomato sauce. 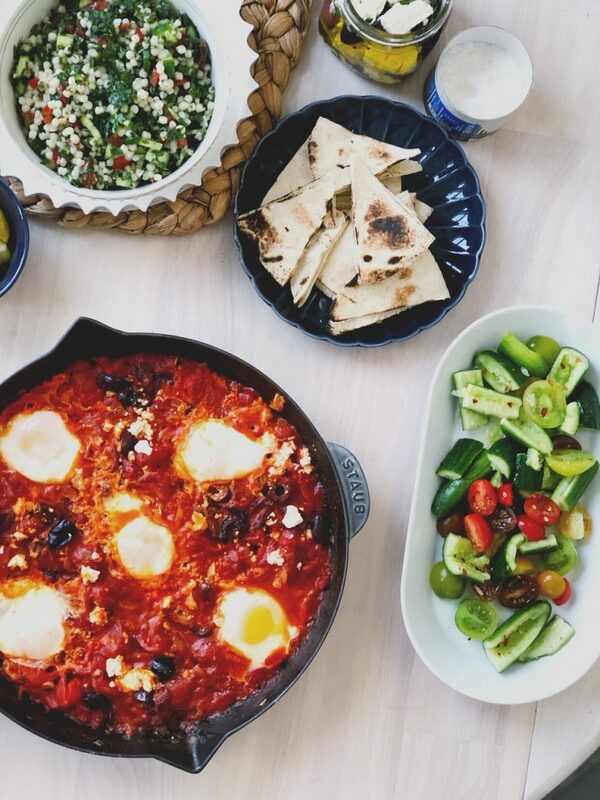 You’ll see so many different varieties of shakshuka, even green shakshukas. You’ll see it with different spices, with or without red peppers, with or without feta and olives. This is just my favorite way to make it. Once you master the basics, you’ll be able to whip this up in no time with a few ingredients you likely always have on hand. 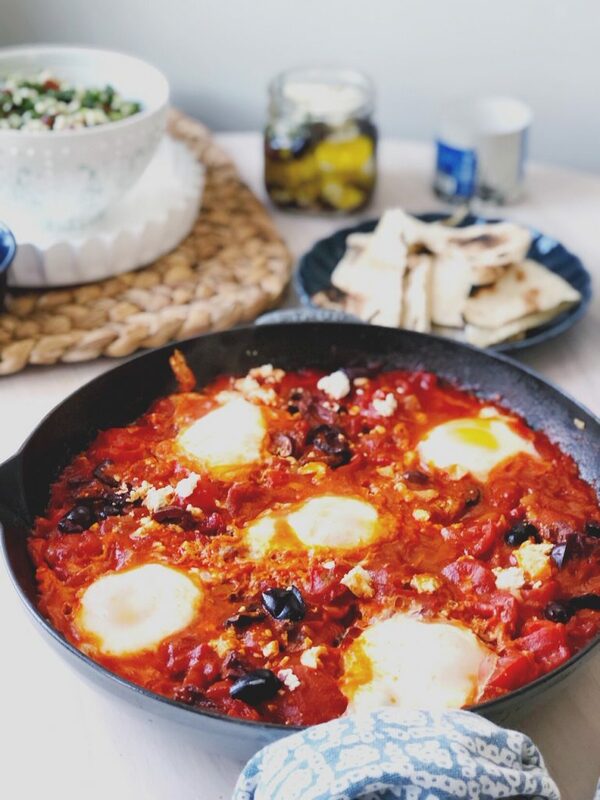 You don’t need anything fancy to make shakshuka, either! Just a nice big skillet. And hey, you could even make this smaller! 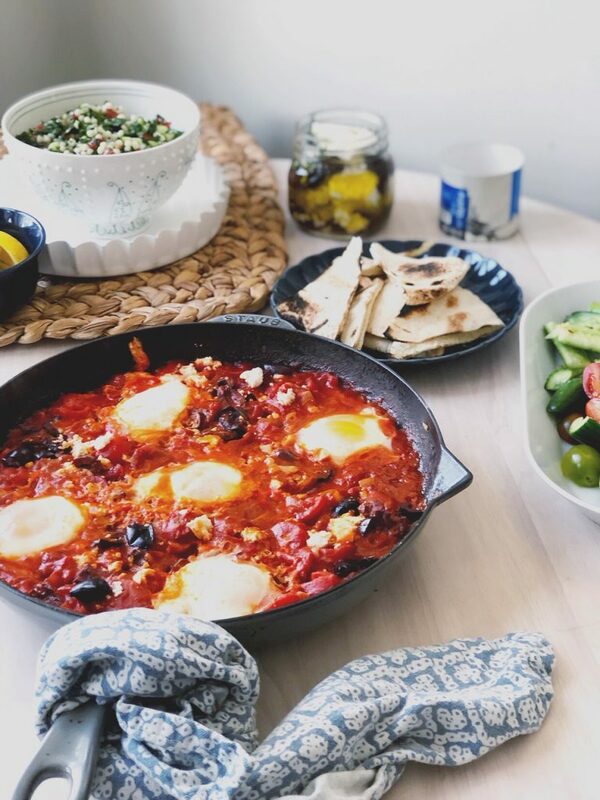 Use a few ramekins or a smaller baking dish and a smaller can of tomatoes – shakshuka for one? Yes, please! I start my shakshuka by sauteeing diced onion and garlic in butter and olive oil and a dash of salt. Once they’re softened, I add paprika and cumin and cayenne. Then in go a whole bunch of pre-sliced red peppers. They add a sweetness that I think really helps to balance the dish. Then tomatoes! 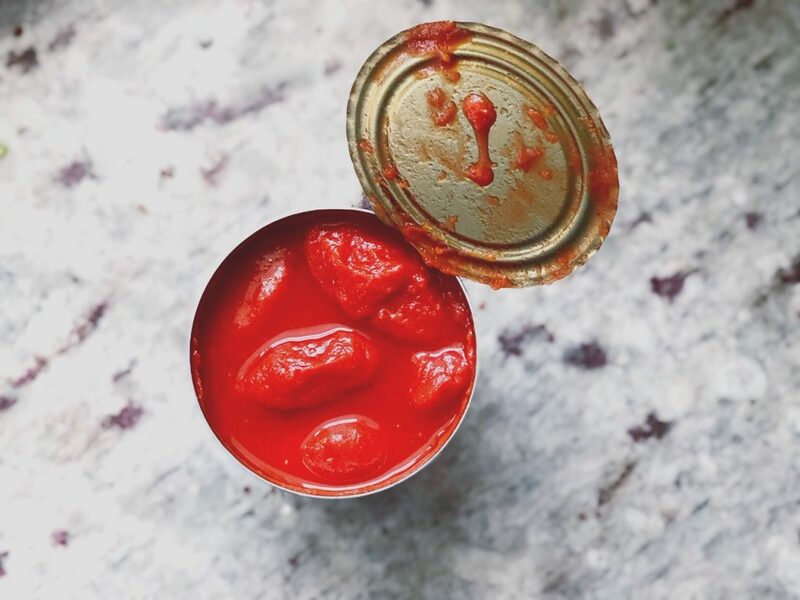 Remember, once you add tomatoes, your veg will stop cooking, so if you like soft onions make sure to get them there before adding the can of tomatoes! I prefer to use whole plum tomatoes for this, I think they taste the best, and I really love a chunky tomato. You can use a can of crushed, if you prefer. But this little trick helps so much: use your kitchen sheers to cut the plum tomatoes up right in the can! It’s much cleaner than dumping them out on your cutting board to chop, and safer than dumping them in the skillet and crushing with your hands. I let the tomatoes come to a simmer and start to blend with the spices. Here is when you want to taste for salt – get the balance right. I like everything a bit salty, so just keep adjusting and tasting. Then you’ll make 4 or 5 little wells in the sauce, crack in the eggs and add the feta and olives if you’re using them. Feel free to skip! Then, you cover your skillet until the eggs are set – you can also bake at 350 until your eggs set up! Serve with tabbouleh, toasted pita, marinated feta & olives and Bon Appetit Magazine’s Smashed Cucumber Salad. A simple dish, perfect for any meal of the day, from breakfast to dinner to a snack for one. See notes for adjusting this to one or two servings. Optional: Preheat the oven to 350 if you want to bake your eggs. They can be made on the stovetop, without the oven, by covering the skillet with a lid. Please use an oven-safe skillet if you want to bake your eggs. Melt butter and olive oil over medium heat in skillet (oven-proof if you want to bake your eggs). Add diced onion and minced onion with a bit of salt to melted butter and olive oil. Sautee until soft. Add spices and sautee until well combined and fragrant. Add roasted red peppers and stir to combine. Cut up whole plum tomatoes with kitchen sheers in the can. Add cut up tomatoes to the skillet. Cut any remaining chunks with kitchen sheers. Stir and bring mixture to a simmer, about 5 minutes. Create a well for each of your eggs, 4 to 5 total. Crack eggs into a bowl, ensuring no shell is in the bowl, then pour the egg into a well. Repeat with remaining eggs. Cover with lid and simmer over medium low heat until eggs are set. Alternatively, bake eggs for about 10 minutes at 350, or until set. Serve with toasted pita or naan. 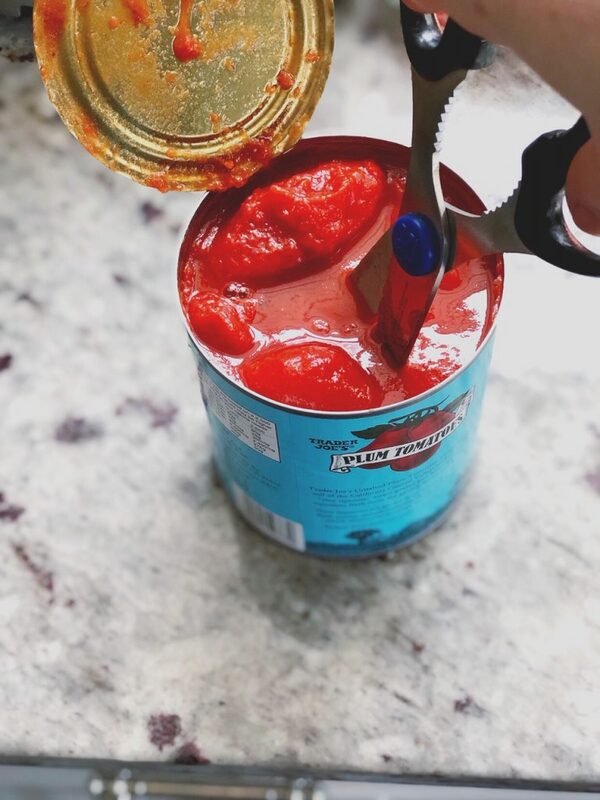 Use kitchen sheers to cut up tomatoes right in the can! When I add them to the skillet, I use the kitchen sheers to cut any remaining chunks right in the skillet – much neater than dumping them out on a cutting board! Use the smaller can of tomatoes, and onions, garlic and spices to taste. Recommend baking in ramekins in the oven at 350 for about 10 minutes or until eggs reach desired doneness.